Heavy Fire: Special Operations, take part in the intense military campaign! 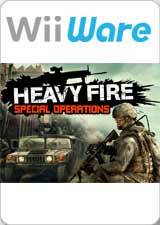 Join the elite army unit in Heavy Fire: Special Operations, an arcade shooter for the WiiWare service. Play challenging missions in the Middle East from the ground, Humvee or Blackhawk. You will need a quick trigger-finger to finish extremely dangerous levels. Rise through the military ranks and get additional and more powerful weapons differing in features and controls. Replay the game to improve your best score that can be submitted to the world ranking. Make combos and smash the environment to get more points. You can take out enemies in a single-player mode or with the added firepower of your friend in multi-player mode! The Wii Zapper accessory is supported, but not required. The graph below charts the compatibility with Heavy Fire: Special Operations since Dolphin's 2.0 release, listing revisions only where a compatibility change occurred. This page was last edited on 11 January 2018, at 12:11.